Almyros or Halmyros (Greek: Αλμυρός, which means salty) is a town and a municipality of the regional unit of Magnesia, region of Thessaly, Greece. It lies in the center of prosperous fertile plain known as 'Krokio Pedio', which is crossed by torrents. Almyros is an important agricultural and commercial center of Magnesia, and is also developing as a tourist center for the area, the main agricultural products are tomatoes, cotton, wheat, almonds, peanuts and pistachio nuts. The history of Almyros begins with the ancient city of Alos (about 10 km south of Almyros), the ruins of which can still be visited. Alos was a very important and populous town, famous for its port and for its role in the Persian Wars, after the Byzantine Empire, because of pirate raids, they built the town in the place that it is today. 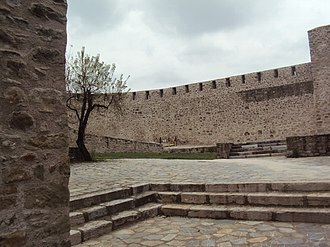 Halmyros was the site of the decisive Battle of Halmyros on 15 March 1311, where the Catalan Company shattered the assembled feudal armies of Frankish Greece and conquered the Duchy of Athens. 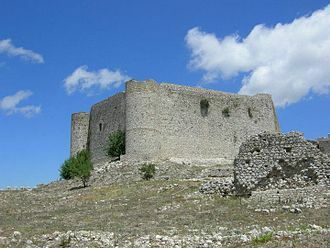 In 1838, the settlement was described as being "a Turkish town, situated on the western coast of the Pagasitic Gulf, half an hour's journey inland, on the Plain of Krokios, and consisting of some 300 dwellings, it is chiefly inhabited by Turks, with only a few Christian settlers, who cultivate the lands of the Turks residing there". The Ottoman Empire ceded most of Thessaly in 1881, followed by development and repopulation by Greeks. In 1980 a catastrophic magnitude 6.5 earthquake destroyed most of the town. The municipality has an area of 905.364 km2, the municipal unit 473.940 km2. The municipal unit of Almyros is divided into the following communities: Almyros, Efxeinoupoli, Anthotopos, Kokkotoi, Kroki, Kofoi, Platanos, and Fylaki. The province of Almyros (Greek: Επαρχία Αλμυρού) was one of the provinces of Magnesia. It had the same territory as the present municipality, it was abolished in 2006. 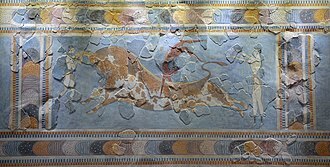 The Archaeological Museum of Almyros includes local artifacts and exhibits from the Neolithic period, through Mycenean, Geometric, Classical, Hellenistic periods, and later Roman years. Opposite the museum is the old High School, the Gymnasium of Almyros, which is a classic monumental building from the beginning of the 20th century, the Museum and Gymnasium are the oldest buildings in the area. The Kouri forest, about 2 km from the town of Almyros, at an elevation of 75m, encompasses 108 ha of lowland oak forest. The forest is flat (elevation gadient is less than 2%). 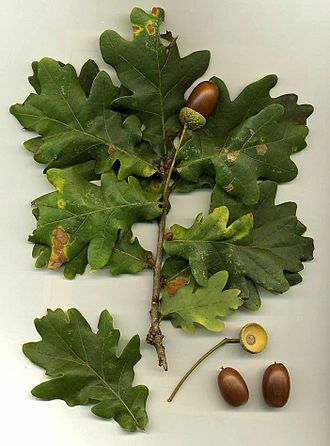 Oaks belong to the species: Quercus pubescens, Quercus aegilops, Quercus pedunculiflora. There are footpaths, as well as a miniature train for a brief tour through the woods and over small bridges. The area is important to migratory birds, such as the mute swan, spoonbill, glossy ibis, and various herons. South of the town are the moderately wooded Othrys mountains. 17 km from the town of Almyros but still in Almyros province, high in the Othrys mountains, is the 12th century Monastery of Panagia Xenia, with wall paintings, treasuries, and a library. There are several sandy beaches in the municipality of Almyros. Almyros is situated near the western end of the Pagasetic Gulf, 25 km southwest of Volos. Motorway 1 (Athens – Thessaloniki) passes east of the town Almyros. 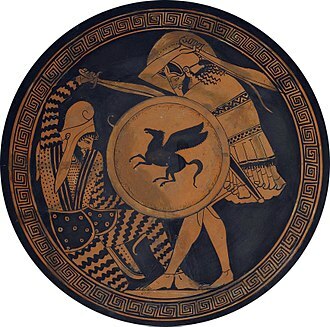 ^ Almyros History. Retrieved 2007-07-12. ^ Almyros' Archaeological Museum Archived 2013-09-28 at the Wayback Machine. .Retrieved 2014-02-27. ^ "NatureBank – Τοπίο (ΤΙΦΚ) – Αισθητικό Δάσος Κουρί Αλμυρού". filotis.itia.ntua.gr. Retrieved 2016-03-12. ^ "Ανάλυση και αξιολόγηση του «Κουρί» Αλμυρού Μαγνησίας : αειφορικός σχεδιασμός και διαχείριση του τοπίου της πολιτισμικής μας κληρονομιάς". Aristotle University of Thessaloniki Institutional Repository – IKEE. Retrieved 2016-03-12. ^ Kouri Almyrou Archived 2007-09-27 at the Wayback Machine. Hellenic Republic Ministry of Tourism. Retrieved 2007-07-12. ^ Magnesia Greece, History and Christianity Pelion. 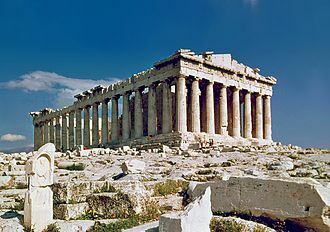 Thegreektravel.com (commercial website). Retrieved 2007-07-12. ^ The Sights of Almiros Greek Travel Pages (commercial website). Retrieved 2007-07-12. ^ Almyros (ALS), Town, Magnesia Greek Travel Pages (commercial website). Retrieved 2007-07-11. ^ a b Athena 2001 Archived 2008-09-05 at the Wayback Machine. Hellenic Republic Ministry of Economy and Finance, National Statistical Service of Greece. Retrieved 2007-07-11. 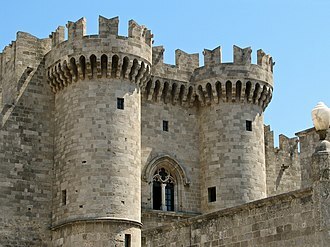 Wikivoyage has a travel guide for Almyros. Agios Dimitrios Church in Almyros TrekEarth. Site includes several dozen photographs in and around Almyros, including the Kouri forest, Monastery of Panagia Xenia, and Almyros beach. The Jewish Community of Volos "KIS, the Central Board of Jewish Communities in Greece" website. Includes history of Jewish communities in the Almyros region. 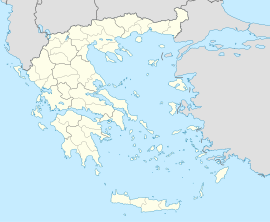 The Greek Motorway 1, code, A1, is a motorway in Greece. Partly under construction, it is the 2nd longest motorway in Greece, before the European routes numbers were changed, the northern part from Efzoni to EO2 was E5N while today, the entire road is part of European route E75. The part west of downtown Athens runs over the Cephisus river, from north of the boundary of Voiotia - Phthiotis, up to near Velestino, the tollway runs close to the coast of the Aegean Sea. It continues north of the Tempe Valley and up to the junction of the European route E90. It shares a 25 km common part with A2 / E90, and then, at the Axios Interchange, continues north to Evzonoi and its total length is approximately 550 km. The motorway used to be entirely a 2-lane highway and ended near Katerini until 1973, the section Athens - Lamia opened in August 1962 as a 14 m width road. The section Lamia - Larissa opened in October 1967 as a 14 m width road, the section Larissa - Katerini opened in September 1959 as a 13 m width road. The section Katerini - Thessaloniki opened in September 1973 as a 14 m width road, the section Axios junction - Evzoni opened in July 1973. The section Axios junction - Polykastro opened as a 14 m width road, when it was extended to Thessaloniki and to the border with the Republic of Macedonia, the motorway had 4-lanes. It was extended during construction in the north in the 1980s, in 1995, Motorway 1 had motorway characteristics in the sections Athens - Thebes and Kleidi - Thessaloniki, while the section Thebes - Kleidi was an undivided 14 m road. In 1998, the motorway had 6-lanes up to north of Thebes, since then, the Larissa bypass has been constructed. As of 2015 it complies with all standards for most of its length, except for 25 km through the Tempe Valley. Construction is under way to upgrade this part to a modern motorway, among others, this part includes the longest road tunnel in the Balkans, which is about 6 km long, as well as 2 more tunnels. It was scheduled to be completed by late 2015 or early-mid 2016, the new circular road round Athens now means that traffic can continue to the Peloponnese, linking up with the motorway under construction to the port city of Patras and that of Kalamata. 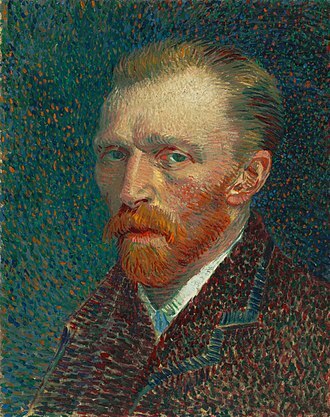 The term derives from the fact that the Orthodox Greeks called the Western European Catholics Latins, most of whom were of French or Venetian origin. The Latin Empire, centered in Constantinople and encompassing Thrace and Bithynia and its territories were gradually reduced to little more than the capital, which was eventually captured by the Empire of Nicaea in 1261. Duchy of Philippopolis, fief of the Latin Empire in northern Thrace, lemnos formed a fief of the Latin Empire under the Venetian Navigajoso family from 1207 until conquered by the Byzantines in 1278. Its rulers bore the title of megadux of the Latin Empire, the Kingdom of Thessalonica, encompassing Macedonia and Thessaly. The brief existence of the Kingdom was almost continuously troubled by warfare with the Second Bulgarian Empire, eventually, it was conquered by the Despotate of Epirus. The County of Salona, centred at Salona, like Bodonitsa, was formed as a state of the Kingdom of Thessalonica. It came under Catalan and Navarrese rule in the 14th century and it was finally conquered by the Ottomans in 1410. The Marquisate of Bodonitsa, like Salona, was created as a vassal state of the Kingdom of Thessalonica. 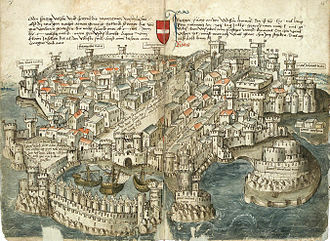 In 1335, the Venetian Giorgi family took control, and ruled until the Ottoman conquest in 1414, the Principality of Achaea, encompassing the Morea or Peloponnese peninsula. It quickly emerged as the strongest Crusader state, and prospered even after the demise of the Latin Empire and its main rival was the Byzantine Despotate of the Morea, which eventually succeeded in conquering the Principality. It exercised suzerainty over the Lordship of Argos and Nauplia, the Duchy of Athens, with its two capitals Thebes and Athens, and encompassing Attica and parts of southern Thessaly. In 1311, the Duchy was conquered by the Catalan Company, and in 1388, it passed into the hands of the Florentine Acciaiuoli family, the Duchy of Naxos or of the Archipelago, founded by the Sanudo family, it encompassed most of the Cyclades. In 1383, it passed under the control of the Crispo family, the Duchy became an Ottoman vassal in 1537, and was finally annexed to the Ottoman Empire in 1579. The mute swan is a species of swan and a member of the waterfowl family Anatidae. It is native to much of Eurasia, and the far north of Africa and it is an introduced species in North America and southern Africa. The name mute derives from it being less vocal than other swan species, measuring 125 to 170 cm in length, this large swan is wholly white in plumage with an orange beak bordered with black. It is recognisable by its pronounced knob atop the beak, which is larger in males, the mute swan was first formally described by the German naturalist Johann Friedrich Gmelin as Anas olor in 1789, and was transferred by Johann Matthäus Bechstein to the new genus Cygnus in 1803. It is the species of the genus Cygnus. Both cygnus and olor mean swan in Latin, cygnus is a variant form of cycnus, a borrowing from Greek κύκνος kyknos, a word of the same meaning. Despite its Eurasian origin, its closest relatives are the black swan of Australia, the species is monotypic with no living subspecies. Mute swan subfossils,6,000 years old, have found in post-glacial peat beds of East Anglia. They have been recorded from Ireland east to Portugal and Italy, the paleosubspecies Cygnus olor bergmanni, which differed only in size from the living bird, is known from fossils found in Azerbaijan. Fossils of swan ancestors more distantly allied to the mute swan have been found in four U. S. states, Arizona, the timeline runs from the Miocene to the late Pleistocene, or 10,000 BP. 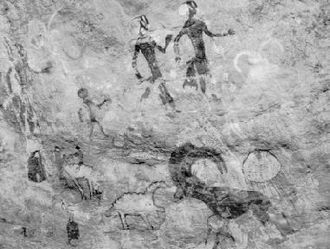 The latest find was in Anza Borrego Desert, a park in California. Adults of this large swan typically range from 140 to 160 cm long, although can range in extreme cases from 125 to 170 cm, males are larger than females and have a larger knob on their bill. On average, this is the second largest waterfowl species after the trumpeter swan, among standard measurements of the mute swan, the wing chord measures 53–62.3 cm, the tarsus is 10–11.8 cm and the bill is 6. 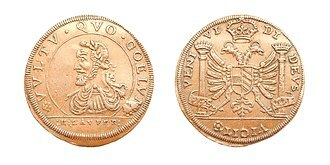 9–9 cm. The mute swan is one of the heaviest flying birds, young birds, called cygnets, are not the bright white of mature adults, and their bill is dull greyish-black, not orange, for the first year. Turkish people, or the Turks, known as Anatolian Turks, are a Turkic ethnic group and nation living mainly in Turkey and speaking Turkish, the most widely spoken Turkic language. They are the largest ethnic group in Turkey, as well as by far the largest ethnic group among the speakers of Turkic languages, ethnic Turkish minorities exist in the former lands of the Ottoman Empire. 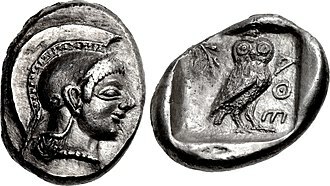 In addition, a Turkish diaspora has been established with modern migration, the ethnonym Turk may be first discerned in Herodotus reference to Targitas, first king of the Scythians, during the first century AD. Pomponius Mela refers to the Turcae in the north of the Sea of Azov. The first definite references to the Turks come mainly from Chinese sources in the sixth century, in these sources, Turk appears as Tujue, which referred to the Göktürks. Although Turk refers to Turkish people, it may sometimes refer to the wider language group of Turkic peoples. In the 19th century, the word Türk only referred to Anatolian villagers, the Ottoman ruling class identified themselves as Ottomans, not usually as Turks. In the late 19th century, as the Ottoman upper classes adopted European ideas of nationalism the term Türk took on a more positive connotation. The Turkish-speakers of Anatolia were the most loyal supporters of Ottoman rule, Turkish Jews, Christians, or even Alevis may be considered non-Turks. On the other hand, Kurdish Arab followers of the Sunni branch of Islam who live in eastern Anatolia are sometimes considered Turks, article 66 of the Turkish Constitution defines a Turk as anyone who is bound to the Turkish state through the bond of citizenship. 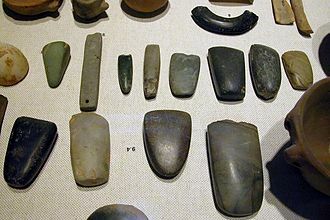 Anatolia was first inhabited by hunter-gatherers during the Paleolithic era, most of the Turkic peoples were followers of Tengriism, sharing the cult of the sky god Tengri, although there were adherents of Manichaeism, Nestorian Christianity and Buddhism. 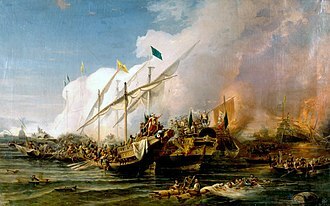 However, during the Muslim conquests, the Turks entered the Muslim world proper as servants, during the booty of Arab raids, the Turks began converting to Islam after Muslim conquest of Transoxiana through the efforts of missionaries and merchants. 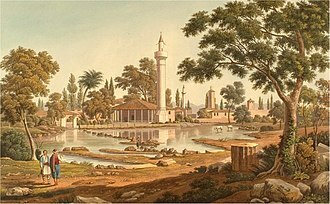 Although initiated by the Arabs, the conversion of the Turks to Islam was filtered through Persian, under the Umayyads, most were domestic servants, whilst under the Abbasids, increasing numbers were trained as soldiers. 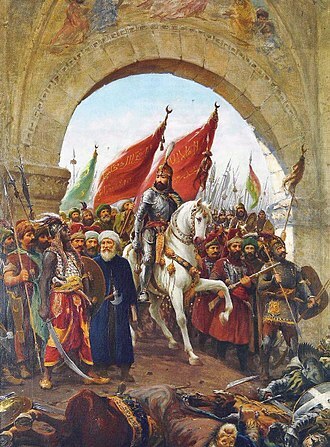 By the ninth century, Turkish commanders were leading the caliphs’ Turkish troops into battle, as the Abbasid caliphate declined, Turkish officers assumed more military and political power taking over or establishing provincial dynasties with their own corps of Turkish troops. During the 11th century the Seljuk Turks who were admirers of the Persian civilization grew in number and were able to occupy the province of the Abbasid Empire. 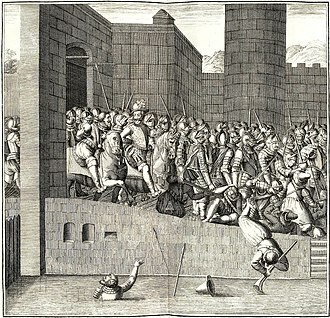 By 1055, the Seljuk Empire captured Baghdad and began to make their first incursions into the edges of Anatolia, when the Seljuk Turks won the Battle of Manzikert against the Byzantine Empire in 1071, it opened the gates of Anatolia to them. Although ethnically Turkish, the Seljuk Turks appreciated and became the purveyors of the Persian culture rather than the Turkish culture, in dire straits, the Byzantine Empire turned to the West for help setting in motion the pleas that led to the First Crusade. The history of Byzantine Greece mainly coincides with the Eastern Roman or Byzantine Empire. The Greek peninsula became a Roman protectorate in 146 BC, Athens and other Greek cities revolted in 88 BC, and the peninsula was crushed by the Roman general Sulla. 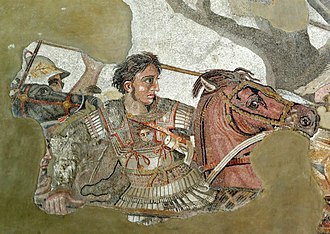 The Roman civil wars devastated the land even further, until Augustus organized the peninsula as the province of Achaea in 27 BC, Greece was a typical eastern province of the Roman Empire. Romans tended to be philhellenic and Greeks were generally loyal to Rome, life in Greece continued under the Roman Empire much the same as it had previously, and Greek continued to be the lingua franca in the Eastern and most important part of the Empire. Roman culture was influenced by classical Greek culture as Horace said. 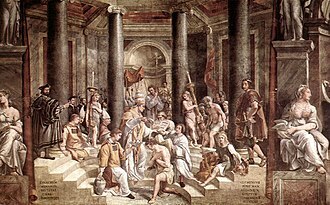 During that period, Greek intellectuals such as Galen or Apollodorus of Damascus were continuously being brought to Rome, within the city of Rome, Greek was spoken by Roman elites, particularly philosophers, and by lower, working classes such as sailors and merchants. The emperor Nero visited Greece in 66, and performed at the Olympic Games, despite the rules against non-Greek participation. He was, of course, honored with a victory in every contest, hadrian was particularly fond of the Greeks, before he became emperor he served as eponymous archon of Athens. He built his namesake arch there, and had a Greek lover, at the same time Greece and much of the rest of the Roman east came under the influence of Christianity. The apostle Paul had preached in Corinth and Athens, and Greece soon became one of the most highly Christianized areas of the empire, during the second and third centuries, Greece was divided into provinces including Achaea, Epirus vetus and Thracia. During the reign of Diocletian in the late 3rd century, the western Balkans were organized as a Roman diocese, under Constantine I Greece was part of the dioceses of Macedonia and Thrace. The eastern and southern Aegean islands formed the province of Insulae in the Diocese of Asia, Greece faced invasions from the Heruli and Vandals during the reign of Theodosius I.
Stilicho, who acted as regent for Arcadius, evacuated Thessaly when the Visigoths invaded in the late 4th century, Arcadius Chamberlain Eutropius allowed Alaric to enter Greece, and he looted Corinth, and the Peloponnese. Stilicho eventually drove him out around 397 and Alaric was made magister militum in Illyricum. Eventually and the Goths migrated to Italy, sacked Rome in 410, and built the Visigothic Empire in Iberia and southern France, Greece remained part of the relatively unified eastern half of the empire. Contrary to outdated visions of late antiquity, the Greek peninsula was most likely one of the most prosperous regions of the Roman, older scenarios of poverty, barbarian destruction and civil decay have been revised in light of recent archaeological discoveries. In fact the polis, as an institution, appears to have remained prosperous until at least the sixth century, contemporary texts such as Hierocles Synecdemus affirm that in late Antiquity, Greece was highly urbanised and contained approximately 80 cities. Quercus pubescens, the downy oak or pubescent oak, is an oak in the white oak section of the genus, Quercus sect. It is native to southern Europe and southwest Asia, from northern Spain east to the Crimea and it is found in France and parts of central Europe. Downy oaks typically grow in dry, lime-rich soils and it is a submediterranean species, growing from the coastline to deep in the continent. Its optimum is in the region, characterized by hot dry summers. In western and central Europe, downy oak is confined to areas with submediteranean microclimate or to coastlines of former lakes, Quercus pubescens is a medium-sized deciduous tree growing up to 20 m. Forest-grown trees grow tall, while open-growing trees develop a very broad and they are long-lived, to several hundred years, and eventually grow into very stout trees with trunks up to 2 m in diameter. Open-grown trees frequently develop several trunks, the bark is very rough, light grey and divided into small flakes. 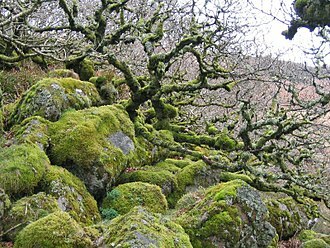 Large trees develop very thick whitish bark cracked into deep furrows, similar to the Pedunculate oak, the twigs are light purple or whitish, tomentose. The buds are small and blunt, light brown, the leaves are leathery usually 4–10 cm long and 3–6 cm wide, usually widest beyond the middle. The leaves group at the ends of twigs, the upper leaf surface is dark green and rough, the lower light green. Both leaf surfaces are covered with minute pubescence which is sometimes lost in older leaves by late summer, the young expanding leaves are whitish or pinkish with very soft tomentum. The leaf shape is variable, divided into 3-7 pairs of deep or shallow lobes. The lobes are usually blunt, rarely sharp, the apex is usually wide and round. 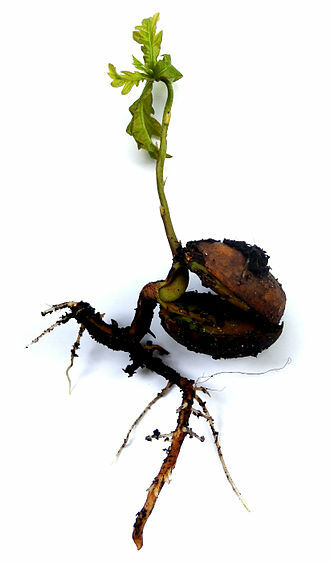 The base of the leaf is heart shaped, widely rounded or sometimes pointed, the petioles are 4–15 mm long and pubescent. The leaves are persistent late into the autumn, remaining green up to early winter and they eventually turn russet or brown and fall off. The Quercus pubescens acorns are brown to yellow, 8–20 mm long, usually thin. 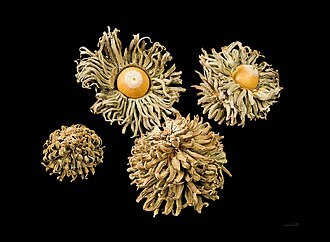 The acorn cups are light grey to almost white, with pointed, overlapping scales, the acorn stalks are thick and pubescent, up to 2 cm long. Spoonbills are a group of large, long-legged wading birds in the family Threskiornithidae, which includes the ibises. The genus name derives from Latin and means broad, referring to the distinctive shape of the bill. Six species are recognised, all placed in a single genus or three genera. They are most closely related to the Old World ibises, all spoonbills have large, spatulate bills and feed by wading through shallow water, sweeping the partly opened bill from side to side. The moment any small aquatic creature touches the inside of the insect, crustacean. Spoonbills generally prefer fresh water to salt but are found in both environments and they need to feed many hours each day. Spoonbills are monogamous, but, so far as is known, most species nest in trees or reed beds, often with ibises or herons. The female lays a clutch of three smooth, white eggs and both parents incubate, chicks hatch one at a time rather than all together. The newly hatched young are blind and cannot care for themselves immediately, chicks bills are short and straight, and only gain the characteristic spoonbill shape as they mature. Arch of Galerius and Rotunda, Thessaloniki. Remains of the Palace of Galerius in Thessaloniki (Navarinou Square), near the Hippodromus where the Massacre of Thessalonica took place during the reign of Theodosius I.
Alaric I in Athens by Ludwig Thiersch. Two mute swan cygnets a few weeks old. The cygnet on the right is of the "Polish swan" colour morph, and carries a gene responsible for leucism.